Despite out best efforts as coders, automated processes sometimes fail. One of the principle ways to troubleshoot such processes is to log data to a file so you can follow what happened after-the-fact. I have a TON of scripts that have to do this, so it made sense to cobble together some functions that make doing this easier. Once you import the module, you call New-LogFile to setup a new file to write to. You can specify options to append the weekday to the file or a more specific timestamp (e.g. MyLog_mmddyyyyhhmmss.log) to the log file. For timestamped log files, you can also setup retention so old log files get automatically deleted after a period of time or after so many accumulate. 1) Standard – The log file path you pass is will be unchanged by the function. The purging parameters are ignored, you must use -Append or it will be overwritten if it exists already. When you call New-LogFile with circular naming and the *same* log file path again that same day, it will automatically be appended to. When the next Monday rolls by, it *automatically* overwrites it. This scheme is good if you call the script that writes to the log file frequently, don’t want to manage a large number of log files, and don’t need more than 7 days of log file history. This means every time you call New-LogFile (Assuming you wait at least 1 second! ), you get a unique log file. Append is essentially ignored. The PurgeAfter and KeepNumberOfFIles, if specified, will cause the New-LogFile function to call Remove-LogFiles automatically and keep your log files trimmed as you specify. If you specify both PurgeAfter AND KeepNumberOfFiles, both thresholds are observed (meaning the file needs to be older than what you specified with PurgeAfter AND you have to have KeepNumberOfFiles remaining). This scheme is good if you need a specified history of log files and want individual log files for each run of your process. The automatic cleanup is a bonus. This module does depend on my bsti.conversion module, so if you use this module as a whole you need both modules. I posted about that module here. Here is a link to the new bsti.logging module. Here is a link to the bsti.conversion module. This entry was posted in Automation, WindowsPowershell and tagged logfile, Powershell on April 11, 2015 by Brandon. I have a ton of Powershell code I’ve written over the last 6 years or so that I’m in the process of cleaning up and looking to share. I plan on re-presenting them as a set of scripts and script modules I’ll be featuring in a series of blog posts coming in the near future. The ConvertTo-TimeSpan function I’ve included in this module does just that. What I use this for is I have functions and scripts I like to write that require the user to pass in an easy time unit value. The conversion function is a little less precise, but a bit more human-readable, which is important to me since most of my users are not .NET programmers and don’t understand the format of a timespan object right offhand. The module files can be downloaded here. Then just use the Import-Module bsti.conversion command as shown above. Not bad for a start, hope you enjoy. This entry was posted in Automation, WindowsPowershell and tagged Powershell on March 29, 2015 by Brandon. 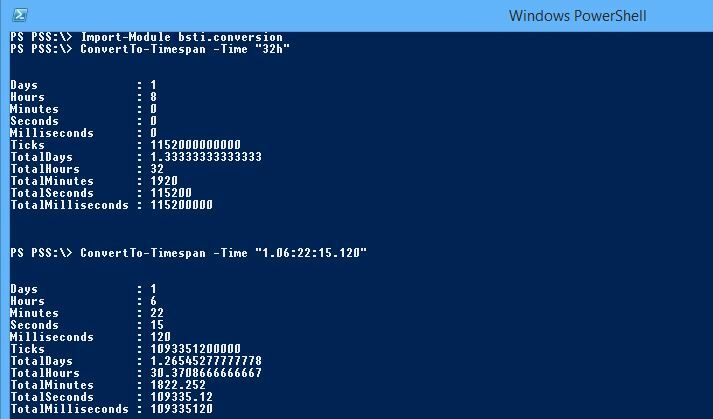 If you love Windows Powershell as much as I do, you probably find yourself using it to complete day-to-day management tasks in addition to scripting and automation. More and more hardware vendors, like NetApp and VmWare, provide very robust Powershell toolsets. Because I’m such a command line guy, and these Powershell libraries are so powerful, I perform nearly all of my management tasks from Powershell. I find tasks like provisioning and destroying storage, creating clones, managing snapshots, and getting data from virtual machines much easier via the command line in many cases. Because this is a day-to-day thing to me, it’s useful to have all of the code I type in and the output I get back automatically logged to a file for future perusal. I liken it to the administrators who manage a lot via SSH, and setup Putty to log all sessions to a file. This allows me to look at past actions, remember how I did stuff, or see what I did wrong if something got messed up. It can also helpful for auditing if you need to track who did what using Powershell. Below is a procedure I use on all management stations I use Powershell from. This procedure automatically logs all activity from the command line to a file. By default, it creates a new transcript file in the C:\users\myusername\LogFiles\Powershell\computername directory. You can override this if you want to go to a central location, by calling the Set-TranscriptFilePath function. It creates one new transcript file per session you launch, so you won’t have multiple sessions writing over the same file. Windows Powershell console profile script. This script is generic enough to be run from any machine. It sets up console logging to a network share for servers and locally for workstations. 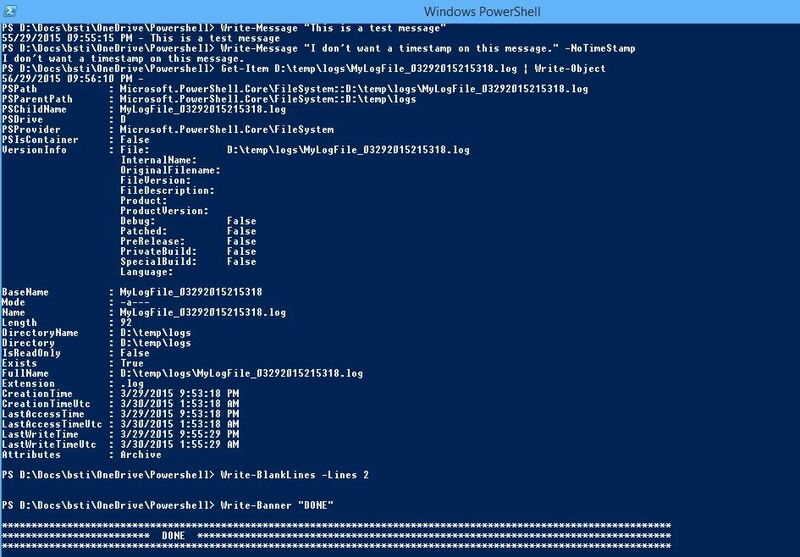 NOTE: This will not transcript in Powershell ISE! Transcripting in ISE is supported in the current (early) version of Windows Management Framework 5.0 however. This function returns the location where Powershell session transcript log files go. $transcriptFilePath = Join-Path $Env:USERPROFILE -ChildPath "LogFiles\Powershell\$($Env:ComputerName)"
This function sets the transcript file path from the default. This affects all future Powershell sessions. $Path = Join-Path $Env:USERPROFILE -ChildPath "LogFiles\Powershell\$($Env:ComputerName)"
Once complete, every new Powershell console session you launch will be automatically transcripted! Note: As of Powershell 4.0, you can’t transcript from the Powershell session that gets launched from Powershell ISE. This is due to a difference in the console. However, I have noticed it works OK in the preview of Windows Management Framework 5.0, so i suspect support for this is coming soon. I’ve uploaded the script here if you’d rather not cut-and-paste. This entry was posted in Automation, WindowsPowershell and tagged Powershell, Windows on March 10, 2015 by Brandon.